3.5 is nearly here! The Update rolls out tomorrow – in the wee hours of the morning. Can’t quite say the exact time, but we know for a fact that it won’t be at Midgnight PST. At least a few hours after that. So let’s say “early morning” to be safe. This Update brings a ton of changes to Shadow Lords (which you can read about here), as well as the introduction of Shadow’s in Shadow Lords, and Shadow Skins (article here). 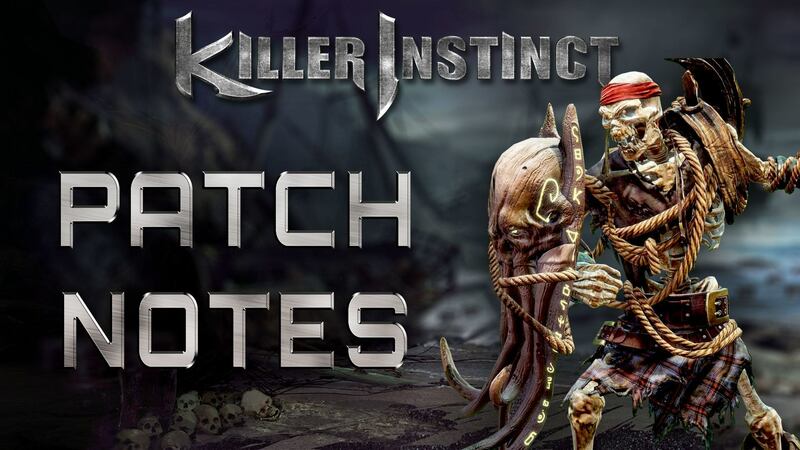 There are also changes coming for those of you playing on PC – you’ll need to be on the Anniversary Update for KI to work – for more on that bit check out this article. Now we’re ready to show you what you’ve all been waiting for – Combat changes! Let’s dive in. Fixed an input bug where players would get the opposite dash intended in various situations while being crossed up. Fixed a bug that let Jago cancel directly into a Tiger’s Fury while charging an Endokuken by kara-cancelling a dash input. Raised the damage on Medium Ragged Edge Linker by ~16% so that it deals similar damage to other medium linkers in the game. Fixed a bug where Heavy Hail would be destroyed if the player was backed up against an Aganos wall. Fixed a bug that let Sadira circumvent the combo system using LK jump cancels when not in instinct. Performing these now will give you the expected Auto Doubles and Linkers. Updated the rules for canceling jump startup so players don’t get linkers and autodoubles before using an opener in a combo. Fixed a bug that caused hitting with widows drop on the same frame of the opponent’s landing to cause a ground bounce instead of the expected ground reaction. Fixed a bug where Sadira’s Shadow Widow’s bite would become unbreakable when performed in a combo started with a normal if no non-projectile move was used before the Shadow Widow’s Bite hit. Fixed a bug that let Orchid cancel directly into a Knee Buster while charging her 3rd Rekka by kara-cancelling a dash input. Spends 1 meter to summon 3 skulls. Fixed a bug where canceling a normal into Shadow Eye Laser sometimes gave you the linker version making it breakable. Fixed a bug where Fulgore’s Cyber Uppercut would autocorrect after the flash. Made TJ Combo’s Flying Knee Special no longer cross over crouching opponents. Fixed a bug where Kan-Ra could not move forward after performing Clutch while backed into the corner. Fixed a bug where B+HP Flame Breath in instinct mode did not have the new juggle properties of the non-instinct version. Relinquish no longer whiffs if performed next to an opponent. Fixed a bug causing counterhit c.hk to not juggle opponents properly. Fixed a bug where a player could back dash when inputting a forward dash while dashing under an opponent. Fix for a bug that could cause light dragon dance to cause a ground bounce on a standing opponent on the first frame they landed from a jump. Fixed a bug causing the first hit of the heavy kick auto double to blow out and preventing the second hit from blowing out. Fixed a bug that let him cancel out of backstab mid-move. Fixed a bug preventing players from canceling openers into Ultra in instinct mode. Fixed a bug where Mira could perform air actions out of the Mist form when on the ground, using up heath. Fixed a bug with Mira’s mist where it was possible to not apply potential damage while it was attached. Fixed a bug where Gargos could perform autodoubles if just his minions hit while landing from a jump attack. Fixed a bug where the minions would be on the wrong side of Gargos if he grabbed them while the opponent jumped over him. That’s all for this update, but we’re excited for tomorrow morning’s release. Oh, while we’re at it, the update should weigh in around 1 GB for those of you that need to plan accordingly. Catch you tomorrow!